Budapest, Hungary - Terez Krt. 22. 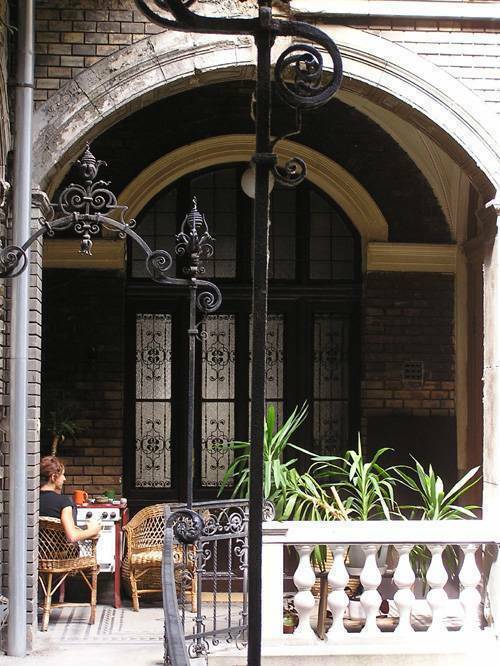 The hostel is located in a breath-taking historical building in one of the most central areas of the city at the one and only eight-angle square of the city called Oktogon, which is a world heritage recognized site. We are very easy to access by all means of public transport: Western railway station (Nyugati pályaudvar) is 5 minutes, Eastern railway station (Keleti pályaudvar) is 15 minutes, Oktogon metro station is one minute away. 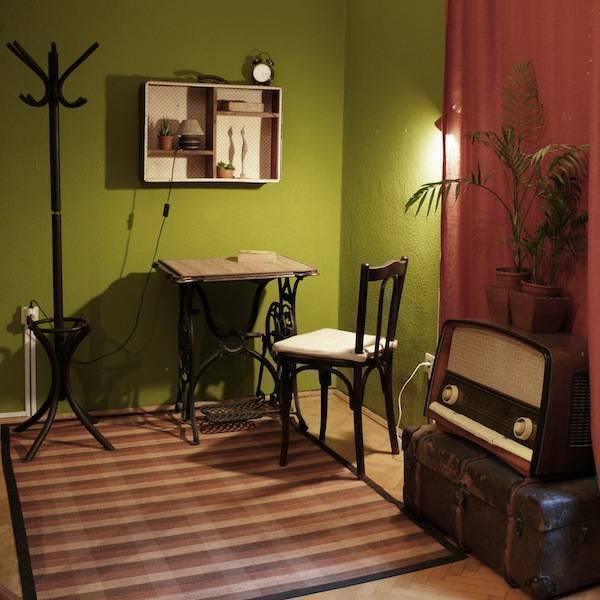 There is a unique, homely common room for chats, making friends and using the internet. All the rooms are equipped with furniture designed and redesigned by our staff! 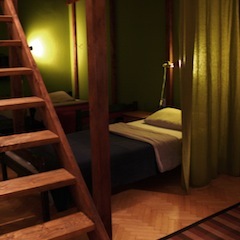 There are three bathrooms as well in the hostel to decrease the morming and evening 'rush hour'. We also offer free Internet access, WIFI in the rooms, free tea and coffeemaps, flyers, brochures on cultural and entertainment venues, lockers, laundry, cold and hot running water, cooking facilities. We also organise programmes and help to get to your next travel destination. The hostel is in the middle of all the hot spots, popular sights, nightlife spots, shops, restaurants, markets, cafés, clubs, theatres and cinemas. Wherever you want to go in the city, it is within a stone-throw. In the neighbourhood you will find ATM machines, currency exchange, post office, pharmacy, pubs, night clubs, movies, restaurants and shops of all sorts.
. 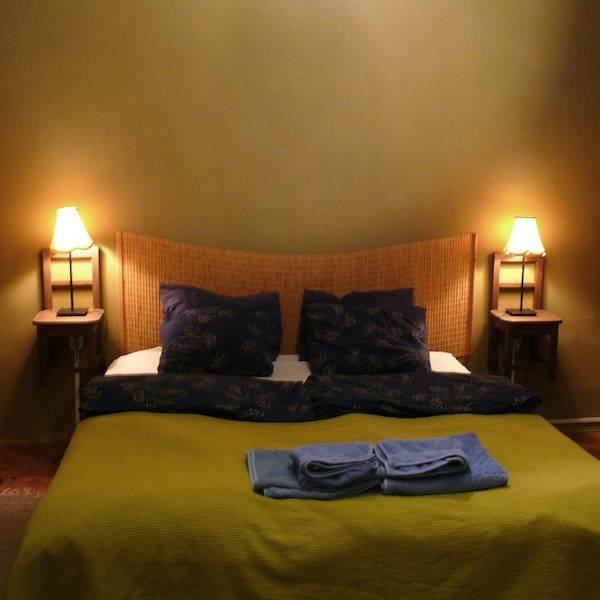 Double room We offer a beautiful, home-designed colourful double-room with TV and continental breakfast. 2. 8-bed dorm (yellow room) The dorm has a beautiful, individually designed loft. There is a TV set and DVD player in the dorm. 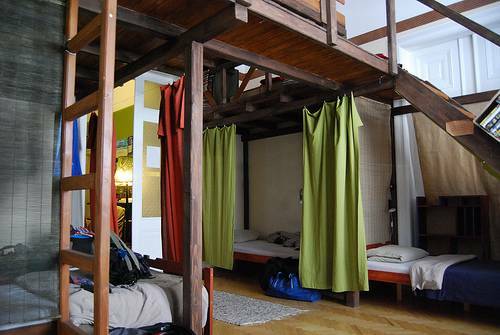 WE RECOMMEND OUR 8-BED DORM FOR PEOPLE WHO ARE LESS BOTHERED BY TALK. 3. 4 bed room (brown room) It more like a private room for small groups, but individuals, lone travellers can also take the room. 4. 6-bed room Relaxed, colourful room with a separate entrance. 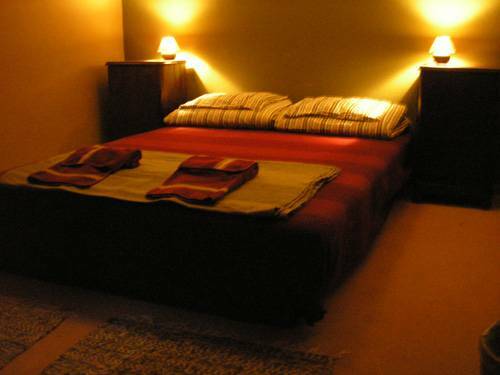 The hostel is located in the entertainment area of the city surrounded by pubs, restaurants, music bars as well as loads of shopping facilities. Guests are required to pay cash on spot. Any reservation will be cancelled if not confirmed 24 hours before arrival. - If you reach Western railway station (Nyugati pályaudvar), take tram No 4 or 6 and go one stop or simply take a short walk on the Great Ring (Teréz körút). If you are at Deak square (Deák tér), where the three metro lines intersect, take metro 1 (M1, yellow line) and go three stops and get off at Oktogon. If you arrive at Eastern railway station (Keleti pályaudvar), there is two options. Take metro 2 (M2, red line) and go to Deak square. Change for M1 and go three stops and get off at Oktogon. Take M2 to Blaha square and change for tram 4 or 6. Go three stops towards the direction of Moscow square (Moszkva tér) and get off at Oktogon. Take the bus no 200 at the airport gate and get off at the terminal (Kõbánya-Kispest, a building complex with a futuristic design). Then change for the blue line (M3) and get off at Deák square, where the three metro lines intersect. Take the yellow line and travel three stops towards the direction of Mexikói út: now you are at Oktogon. Come out of the metro and cross Andrássy boulevard towards the direction of Western station. Walk for 30 seconds and stop at Teréz krt. 22. Taxi and Airport Minibus services are also available at the arrival hall. If you reach Western railway station (Nyugati pályaudvar), take tram No 4 or 6 and go one stop or simply take a short walk on the Great Ring (Teréz körút).